Room 20 @Sunnyhills: Hey there Room 20 looks like we might have a frog! Hey there Room 20 looks like we might have a frog! Thanks to Brodie and Carolyn at lunchtime on Friday for helping me find some rocks because look what has happened today at my house! One of our froglets needs air to breath now as it's lungs have grown and the gills are no longer there to enable it to breath under water! 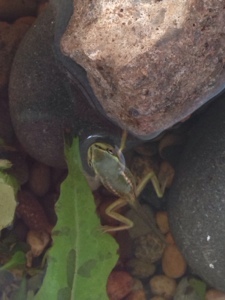 Stones in the water mean the froglet can climb up out of the water. WOW! This is so fascinating. Did you know that frogs are amphibians which means they can live in the water and on land! Just wondering, what species are the tadpoles and frogs?